Parking will be limited tomorrow due to the IASS Conference on campus. Lot A - the west side of Schroeder School of Business Building - will be closed in order to provide parking for conference participants. More than 150 people are expected to attend the conference, including representatives from universities across the United States and overseas. Thank you in advance for helping us make a good impression on our campus visitors. We apologize for any inconvenience! Today UE is hosting the 86th Annual Meeting of the Indiana Academy of Social Sciences. More than 160 faculty and students in the social sciences from universities in Indiana, Illinois, Kentucky, China, India, Iran, Malaysia, and South Africa are expected to attend. The Panel Sessions take place in the Schroeder School of Business Building until 5:00 pm. All UE students are welcome to attend the panels and/or undergraduate poster sessions. If you need additional information contact Young Kim at yk28. The TIAA-CREF representative will be on the UE campus on Tuesday, October 20, for individual counseling sessions. To schedule an appointment, call TIAA-CREF at 1-800-732-8353 or 317-706-6200. The sessions are held in the Clifford Rare Books Room of the University Libraries (room 158). If you have any questions, call Carol McCraney at 488-2943. The 2000 Stair Challenge hosted by the PTA Class of 2017 is planned for October 12-25. Teams of two can sign-up to participate in the challenge in Ridgway University Center on October 7-9 from 1:00 - 4:00 p.m. Each team must have a sponsor. The participation fee is $10. All are welcome to participate. Get a chance to win prizes!! Register via JobLink for the Indiana Means Business Career Fair - an exciting career fair for business-related disciplines! Students in all class levels encouraged to attend. Lisa Nikolidakis, assistant professor of creative writing, will give a talk on the often-confusing process of applying to MFA programs in creative writing on Friday, October 9, in Room 71 Schroeder School of Business Building, at 4 pm. There will be a 40-minute lecture covering what graduate school is like, how to find programs that suit you, writing personal statements, etiquette for requesting letters of recommendation, and putting your writing sample together. Even if you're not sure that the MFA is right for you, Creative Writing majors and minors are especially encouraged to attend. The UE Bookstore is beginning the process of returning unsold books from the Fall term. If you still need a textbook stop by the Bookstore as soon as possible. If you still need a book but don't have the funds to purchase talk to store staff and we'd be happy to hold a copy for you so that it does not get returned. Just a reminder to anyone interested in becoming an Admissions Ambassador - the deadline to apply is Friday, October 9, at noon. Please be sure to have all components of your application, including recommendation, submitted by then. Also, mark on your calendars that interviews will be held October 14 through October 16. We look forward to reviewing your applications! Got a Band? A Solo Act? Do you have a musical talent? Do you perform? We would love for you to submit your act to us! We are part of the GAP initiative and we are throwing a mini concert on the East Terrace of Ridgway University Center on October 17, noon to 1:00 p.m. Prospective students, their families, and UE students will be in the audience. Please send an email with a link of you performing to hc85@evansville.edu, or email hc85@evansville.edu to set up a brief audition, and we will contact you! The UE Bookstore will be closed on Saturday, October 10, due to Fall Break and will resume regular store hours on Monday and Tuesday, October 12 and 13. If you plan to graduate in December 2015 or May 2016, stop by Student Publications, Ridgway University Center, second floor, or call 812.488.2846 to make your 2016 LinC graduate portrait appointment. Portraits are FREE! Are you spending too much time and gas driving from home to campus? Missing out on evening study groups and meetings? Missing out on fun? Living on campus can be an enjoyable experience – but more than that, our research shows that students who live on campus tend to do better academically and be more satisfied with their UE experience. You can still move in to a residence hall right now or for spring semester. Students moving into a residence hall this fall will receive a pro-rated charge for their residence hall and associated meal plan for the remaining weeks of the fall semester. Before you complete your housing and meal plan contracts, the Office of Student Accounts will assist you with setting up payment arrangements. For more information about costs, contracts, and room availability, contact the Office of Residence Life at ext. 2956, or visit the office in the Student Life Center upstairs in Ridgway University Center. After the announcement of the UE Guarantee, there have been questions on how to add the image to email signatures. Here are the steps! If you have questions, please call the OTS Help Desk at 812-488-2077 or help@evansville.edu. 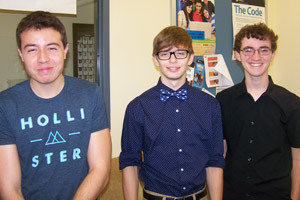 The University of Evansville team of Kane Catt, Evan Higgins, and Guilherme Andrade won first place at the Consortium for Computing Science (CCSC) Midwest Conference Student Programming Contest held Saturday, October 3 at UE. There was a total of 21 teams from around the Midwest region competing. The Evansville team solved 5 problems despite not submitting their first correct solution until almost 3 hours into the 4-hour contest. Second place went to Benedictine University who solved 4 problems, and third place went to Bradley University II who were the fastest to solve 3 problems. Douglas Reed, University Organist Emeritus/Professor of Music Emeritus, performed the opening concert of the 55th Annual Organ Conference at the University of Michigan on October 4, in Hill Auditorium. Titled "A Tribute to William Albright and William Bolcom," the program included works by both composers, members of the faculty of the UM School of Music, Theatre, and Dance for many years. 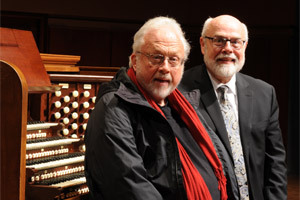 The concert included the Ann Arbor premieres of several unpublished Albright works (Carillon-Bombarde and Whistler (1834-1903): Three Nocturnes] and Reed’s arrangements for solo organ of two sections from William Bolcom’s A Song for St. Cecilia’s Day (SATB/organ, 2008), based on poetry of John Dryden (1687) and written in memory of William Albright (1944-1998). Reed performed on the historic Frieze Memorial Organ, built by E. M. Skinner in 1928. Incorporating pipe work from the Farrand & Votey Columbian Exposition organ (Chicago, 1893), the organ was revised by Aeolian-Skinner in 1955 and had a profound influence on several Albright and Bolcom organ compositions. The University of Evansville Athletics Department is hosting a soccer doubleheader on Saturday, Oct. 10. The men's soccer team returns to Missouri Valley Conference action with a 2:00 p.m. CDT kickoff against Bradley. The women's soccer team will hold Senior Day festivities then play Drake at 6:00 p.m. Both matches will be held at Arad McCutchan Stadium. The University of Evansville men’s soccer team (2-8) was defeated 4-1 at #20 University of Kentucky (7-2-1) on Wednesday night. Playing just 20 minutes from his hometown of Midway, freshman forward Zac Blaydes netted his first career goal on a 72nd minute penalty kick. The Purple Aces are back at home on Saturday, Oct. 10 against Bradley. UK went ahead on a 25th minute goal from sophomore midfielder Kevin Barajas. Evansville was looking for the equalizer in the 31st minute but a shot from sophomore midfielder Ian McGrath sailed high. Down 1-0, UE kept the deficit from growing larger in the 37th minute when sophomore defender Chris Shuck headed a ball off the endline. The Wildcats would push the lead to two with a 44th minute goal just prior to halftime. Up by a pair of scores, Kentucky added goals in the 57th and 67th minutes for the 4-0 advantage. Blaydes recorded his first goal just minutes later. It was the first penalty kick for the Purple Aces this season. Blaydes, McGrath and senior forward Nate Opperman all had a team-high two shots in the contest. Freshman goalkeeper Greg Niven made three saves. The Aces host Bradley this Saturday at Arad McCutchan Stadium at 2:00 p.m. CDT. As part of the doubleheader, the UE women’s soccer team will hold Senior Day festivities and play Drake at 6:00 p.m. CDT.